How important is your data to you? You can respond to this question with words, but the steps you take to protect your data are the real answer. We find it troubling when people lose large quantities of data--because they have no backups--and then they get very upset, talking about "how important that data was!" If it's so important, why wasn't it backed up? If it matters enough to get upset over losing, it's worth protecting, and backups are an essential part of data protection. Unfortunately, viruses spread, hard drives fail, disasters happen, and human error is inevitable. Even theft or intentional sabotage of irreplaceable data by a disgruntled employee is extremely common. So, the question becomes not if you have a significant data loss, but when you have a significant data loss. Acronis True Image 11 is the solution you have been waiting for. This cutting-edge backup software allows you to make a backup of your PC with the OS and apps. In case of a system crash you will be able to restore it in minutes. Your docs, music, photos, Outlook e-mails - just all your data and configurations will be recovered. No reinstallations, only a few mouse clicks – and there you are up and running again! With ATI 11, data loss is no threat anymore! Perform backup in the background, without interrupting other operations! Reduce downtime, getting back to work while restoration is in progress! Make scheduled backups and save them in Acronis Secure Zone, which is a protected partition accessed with Acronis utilities only. The XP-like interface of Acronis True Image makes it even easier to implement backup and restore operations. You will be able to download the full version of the software product immediately after ordering! 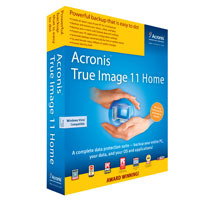 Want to try Acronis True Image v11 Home before ordering? You may click here to download 15-day trial version.